Peel, core, and slice the apples. Toss in a bowl with lemon juice. In a separate bowl, prepare the topping as directed. 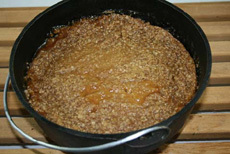 Place apples in 10-inch Dutch oven and add the topping. Bake at 350° for 30 minutes; remove lid for last 15 minutes. Mix butter, sugar, and cinnamon until smooth. Add flour and then oats. Mix well. 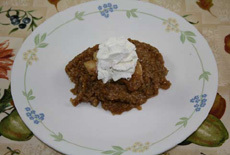 Spoon over apple mixture.